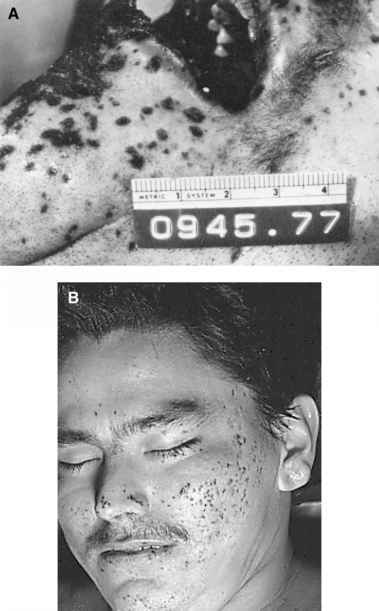 Recovery of a bullet of a particular caliber from a body does not necessarily indicate that the weapon used to fire this missile was of the same caliber as the cartridge in which the bullet was loaded. Certain weapons will chamber and fire ammunition of a caliber different from that for which they are chambered. Some automatic pistols are capable of firing revolver ammunition, and some revolvers can fire automatic ammunition. The .32-caliber revolver is well known for its ability to chamber and fire the semi-rimmed .32 ACP automatic cartridge (Figure 10.21). The .38-caliber Enfield revolver, chambered for the .38 Smith & Wesson cartridge, will accept and fire 9-mm Luger ammunition. Less well known is the fact that many .32 automatic pistols will chamber and fire the .32 Smith & Wesson Short revolver cartridge as well as feed the revolver ammunition from a clip and function the mechanism for at least three or four rounds without jamming. .32 Cartridges have been fired in .38 revolvers by being wrapped in tape so that they completely occupy the larger chamber. 9-mm Parabellum cartridges can be chambered and fired in .40 S&W pistols. The emerging bullet will begin to yaw widely immediately on exiting the barrel. In theory, a .38 Special revolver should not be able to chamber and fire a .38 Smith & Wesson cartridge, as the latter cartridge case has a greater diameter than the former. However, a significant number of .38 Special revolvers have oversized chambers and will accept .38 Smith & Wesson cartridges. During World War II, large numbers of revolvers were manufactured in the United States for Great Britain. These were chambered for the .38 Smith & Wesson cartridge. Since then, many of these revolvers have been brought back to the United States and rechambered for the .38 Special cartridge. These weapons will chamber and fire both cartridges. 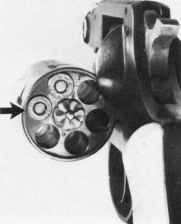 Figure 10.21 .32 revolver loaded with a .32 S & W Short revolver cartridge and a .32 ACP automatic pistol cartridge (arrow). Magnum revolver, increases the velocity and ballistics of the .38 Special cartridge. This, of course, does not occur. The Astra, Model 400, is chambered for the 9-mm Bayard cartridge, which is not readily available in the United States. This particular weapon will chamber and fire the .38 Super cartridge reliably and the 9-mm Luger cartridge unreliably as well as single-fire the .380 ACP cartridge. In the last case, the cartridge case usually bursts. The .32 ACP cartridge can be single-fed and fired in a .380 ACP automatic pistol. The cases rupture, however. Mention should be made of adapters (Figure 10.22). These permit firing of a cartridge in a weapon not chambered for it by the use of a device that fits in the weapon's chamber and will accept a different caliber cartridge. 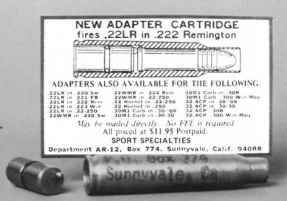 Adapters permit the use of .22 rimfire ammunition in .22-caliber centerfire rifles as well as .32 ACP and .30 Carbine ammunition in high-velocity .30-caliber centerfire rifles. Adapters have been made to permit firing a handgun cartridge from a shotgun and a .410 shotgun cartridge in a 12-gauge shotgun. Ruger manufactures a line of single-shot revolvers that have interchangeable cylinders. Thus, one weapon will fire .38 Special and .357 Magnum ammunition in one cylinder and 9-mm Luger in another interchangeable cylinder. Another weapon fires .45 ACP in one cylinder and .45 Colt in a second. A number of firearms companies manufacture .22 rimfire revolvers with two interchangeable cylinders — one for .22 Short, Long, and Long Rifle cartridges and the other for the .22 Magnum cartridge. Pistol bullets can be loaded in rifle cartridges. Thus, in one case seen by the author an individual was fatally wounded with a 7.62-Luger bullet loaded in a .30 carbine cartridge case. It is also possible to load .32 ACP bullets in any of the .30 centerfire cartridges. The .32 ACP cartridge in turn may be reloaded with a single 00 Buck pellet (0.33 in. diameter) rather than a bullet. Rifles have been and still are being chambered for certain handgun cartridges. Rifles are available in calibers .38 Special, .357 Magnum, 9-mm Parabellum, and .44 Magnum. Specialized single-shot handguns chambered for rifle cartridges have been and still are manufactured. The Thompson-Contender, which features interchangeable barrels, can be obtained in calibers .223 Remington, .25-35 Winchester, and .30-30 Winchester, for example.